Each of these stories is proof that, regardless of the seasons or cliché, New York’s a place where most anyone or anything can start from scratch. You can read the full “refresh” issue here. 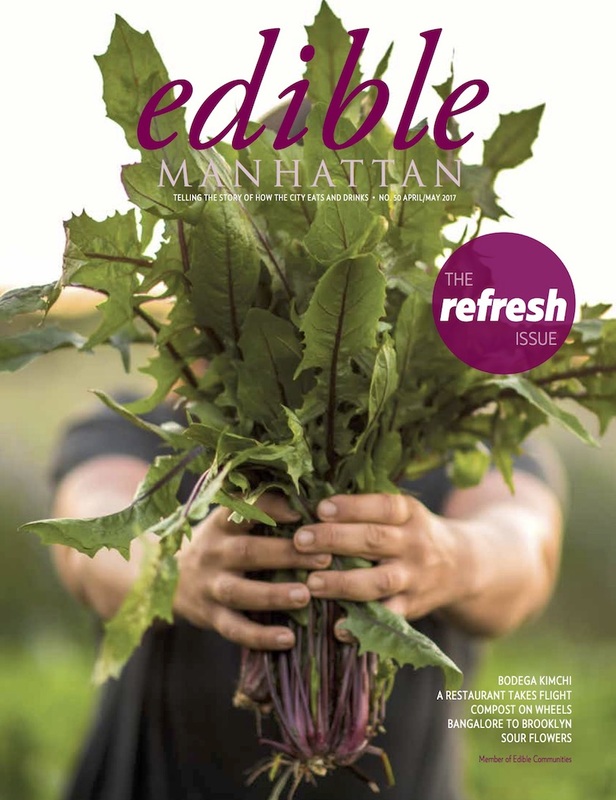 It also includes stories from Edible Brooklyn, Edible Long Island and Edible East End. Use this map to find a hard copy near you, or better yet, subscribe here. The first signs of a New York spring feel redemptive. That’s probably thanks to my Protestant upbringing, but there’s a point in March when shedding my parka, seeing a patch of bright-purple crocuses and smelling had-been-frozen dog poo on the sidewalk could only be the (mostly) benevolent work of some higher power. Assembling this first-ever “refresh” issue has been a welcome escape from gray weather, and in their own ways, each of these stories is proof that, regardless of the seasons or cliché, this city’s a place where most anyone or anything can start from scratch. Take New York’s four dedicated cookbook stores. Sarah Whitman-Salkin blurbs each of them assuring that, if we’re open-minded, these sometimes musty-smelling archives can help us think differently about how and why we cook and eat. Chelsey Simpson then takes us to Bushwick, where in the absence of any municipal curbside compost pickup, a group of local residents is greening the neighborhood by collecting and processing organic waste. A little ways over in Williamsburg, our associate editor Alicia Kennedy also details how Brooklyn’s newly established Forthave Spirits is making a satisfying debut with a beautifully bitter Campari alternative. Back in the kitchen, Pooja Makhijani profiles Chitra Agrawal: a Crown Heights–based food entrepreneur who just released her first cookbook that reinterprets her family’s South Indian vegetarian dishes with many ingredients that are local to New York. Melissa Walker also highlights family tradition with her lovely story about a Windsor Terrace bodega livening up its coolers with kimchi made by the Korean family-owners. Two of my favorite stories in this issue share how chefs are reviving their menus at scale. Rachel Nuwer introduces us to a groundbreaking catering service that exclusively hires refugees with kitchen chops. Then taking us 40,000 feet in the air, Matthew Karkutt tells the story of a Bowery chef who’s revolutionizing JetBlue’s in-flight Mint service menus—think a roast beef sandwich with pickled onions, watercress and muhammara instead of some overly salted mush pie. A couple of these stories take us beyond city limits. Ayden LeRoux celebrates an upstate farm-based residency where some of New York’s most talented artists—we’re talking Pulitzer finalists and MacArthur geniuses—grow literal and creative seeds. Then for all of us who feel the call of the wild come the spring foraging season, Marie Viljoen reminds us to exercise restraint when harvesting increasingly vulnerable ramps and fiddleheads. She even suggests some wild foods that you can grow yourself, bringing that (technically illegal) public park excursion to your own backyard. The issue closes with one of my favorite drinks that, to me at least, just screams “refresh.” Found in some of the city’s historically Senegalese neighborhoods, bissap is a traditional tart hibiscus infusion that makes an ideal warm-weather punch. We got New York–based, Dakar-born chef Pierre Thiam’s recipe that apparently is just as delicious with a little rum, too. Here’s to hoping it’ll soon be warm enough for us to try for ourselves.